This article is about land reclaimed from ocean, riverbeds, or lake beds. For land reclaimed from the desert, see Dedesertification. For the disposal of waste material, see landfill. "Reclaimed" redirects here. For other uses, see Reclaim. Land reclamation, usually known as reclamation, and also known as land fill (not to be confused with a landfill), is the process of creating new land from oceans, riverbeds, or lake beds. The land reclaimed is known as reclamation ground or land fill. In a number of other jurisdictions, including parts of the United States, the term "reclamation" can refer to returning disturbed lands to an improved state. In Alberta, Canada, for example, reclamation is defined by the provincial government as "The process of reconverting disturbed land to its former or other productive uses." In Oceania it is frequently referred to as land rehabilitation. Land reclamation can be achieved with a number of different methods. The most simple method involves filling the area with large amounts of heavy rock and/or cement, then filling with clay and dirt until the desired height is reached. The process is called "infilling" and the material used to fill the space is generally called "infill". Draining of submerged wetlands is often used to reclaim land for agricultural use. Deep cement mixing is used typically in situations in which the material displaced by either dredging or draining may be contaminated and hence needs to be contained. Land dredging is also another method of land reclamation. It is the removal of sediments and debris from the bottom of a body of water. It is commonly used for maintaining reclaimed land masses as sedimentation, a natural process, fills channels and harbors naturally. The Flevopolder in the Netherlands, reclaimed from the IJsselmeer, is the largest reclaimed artificial island in the world. Instances where the creation of new land was for the need of human activities. Some of the coastlines of Saadiyat Island, in the UAE. Used for commercial purposes. Much of the coastlines of Mumbai, India. It took over 150 years to join the original Seven Islands of Bombay. These seven islands were lush, green, thickly wooded, and dotted with 22 hills, with the Arabian Sea washing through them at high tide. The original Isle of Bombay was only 24 km long and 4 km wide from Dongri to Malabar Hill (at its broadest point) and the other six were Colaba, Old Woman's Island, Mahim, Parel, Worli and Mazgaon. (See also Hornby Vellard). Much of the coastlines of Mainland China, Hong Kong, North Korea and South Korea. It is estimated that nearly 65% of tidal flats around the Yellow Sea have been reclaimed. Inland lowlands in the Yangtze valley, China, including the areas of important cities like Shanghai and Wuhan. Much of the coastline of Karachi, Pakistan. The shore of Jakarta Bay. Land is usually reclaimed to create new housing areas and real estate properties, for the rapidly expanding city of Jakarta. So far, the largest reclamation project in the city is the creation of "Golf Island", which is still ongoing. A part of the Hamad International Airport in Qatar, around 36 square kilometres (14 sq mi). The entire island of The Pearl-Qatar situated in West Bay (Doha), Qatar. Haikou Bay, Hainan Province, China, where the west side of Haidian Island is being extended, and off the coast of Haikou City, where new land for a marina is being created. The shore of Manila Bay in the Philippines, especially along Metro Manila, has attracted major developments such as the Mall of Asia Complex, Entertainment City and the Cultural Center of the Philippines Complex. The city-state of Singapore, where land is in short supply, is also famous for its efforts on land reclamation. The Yas Island in Abu Dhabi, UAE. Hulhumalé Island, Maldives. It is one of the six divisions of Malé City. Majority of left-bank and some right-bank residential areas of Kiev were built on a reclaimed fens and floodplains of the Dnieper river. The Hassan II Mosque in Morocco is built on reclaimed land. The Eko Atlantic in Lagos, Nigeria. Parts of Montevideo, Uruguay, Rambla Sur and several projects still going on in Montevideo's Bay. Much of the urbanized area adjacent to San Francisco Bay, including most of San Francisco's waterfront and Financial District, San Francisco International Airport, the Port of Oakland, and large portions of the city of Alameda has been reclaimed from the bay. Mexico City (which is situated at the former site of Lake Texcoco); the chinampas are a famous example. Parts of Panama City urban and street development are based on reclaimed land, using material extracted from Panama Canal excavations. The shore of Nassau, The Bahamas especially along East Bay street. One of the earliest large scale projects was the Beemster Polder in the Netherlands, realized in 1612 adding 70 square kilometres (27 sq mi) of land. In Hong Kong the Praya Reclamation Scheme added 20 to 24 hectares (50 to 60 acres) of land in 1890 during the second phase of construction. It was one of the most ambitious projects ever taken during the Colonial Hong Kong era. Some 20% of land in the Tokyo Bay area has been reclaimed, most notably Odaiba artificial island. Le Portier, Monaco and Gibraltar are also expanding due to land reclamation. The city of Rio de Janeiro was largely built on reclaimed land, as was Wellington, New Zealand. Artificial islands are an example of land reclamation. Creating an artificial island is an expensive and risky undertaking. It is often considered in places with high population density and a scarcity of flat land. Kansai International Airport (in Osaka) and Hong Kong International Airport are examples where this process was deemed necessary. The Palm Islands, The World and hotel Burj al-Arab off Dubai in the United Arab Emirates are other examples of artificial islands (although there is yet no real "scarcity of land" in Dubai), as well as the Flevopolder in the Netherlands which is the largest artificial island in the world. Agriculture was a drive for land reclamation before industrialisation. In South China, farmers reclaimed paddy fields by enclosing an area with a stone wall on the sea shore near a river mouth or river delta. The species of rice that grow on these grounds are more salt tolerant. Another use of such enclosed land is the creation of fish ponds. It is commonly seen on the Pearl River Delta and Hong Kong. These reclaimed areas also attract species of migrating birds. A related practice is the draining of swampy or seasonally submerged wetlands to convert them to farmland. While this does not create new land exactly, it allows commercially productive use of land that would otherwise be restricted to wildlife habitat. It is also an important method of mosquito control. Even in the post-industrial age, there have been land reclamation projects intended for increasing available agricultural land. For example, the village of Ogata in Akita, Japan, was established on land reclaimed from Lake Hachirōgata (Japan's second largest lake at the time) starting in 1957. By 1977, the amount of land reclaimed totalled 172.03 square kilometres (66.42 sq mi). Beach rebuilding is the process of repairing beaches using materials such as sand or mud from inland. This can be used to build up beaches suffering from beach starvation or erosion from longshore drift. It stops the movement of the original beach material through longshore drift and retains a natural look to the beach. Although it is not a long-lasting solution, it is cheap compared to other types of coastal defences. An example of this is the city of Mumbai. As human overcrowding of developed areas intensified during the 20th century, it has become important to develop land re-use strategies for completed landfills. Some of the most common usages are for parks, golf courses and other sports fields. Increasingly, however, office buildings and industrial uses are made on a completed landfill. In these latter uses, methane capture is customarily carried out to minimize explosive hazard within the building. An example of a Class A office building constructed over a landfill is the Dakin Building at Sierra Point, Brisbane, California. The underlying fill was deposited from 1965 to 1985, mostly consisting of construction debris from San Francisco and some municipal wastes. Aerial photographs prior to 1965 show this area to be tidelands of the San Francisco Bay. A clay cap was constructed over the debris prior to building approval. A notable example is Sydney Olympic Park, the primary venue for the 2000 Summer Olympic Games, which was built atop an industrial wasteland that included landfills. Another strategy for landfill is the incineration of landfill trash at high temperature via the plasma-arc gasification process, which is currently used at two facilities in Japan, and will be used at a planned facility in St. Lucie County, Florida. Parts (highlighted in brown) of the San Francisco Bay were reclaimed from wetlands for urban use. Draining wetlands for ploughing, for example, is a form of habitat destruction. In some parts of the world, new reclamation projects are restricted or no longer allowed, due to environmental protection laws. Reclamation projects have strong negative impacts on coastal populations, although some species can take advantage of the newly created area. A map of reclaimed land in Hong Kong: Grey (built), red (proposed or under development). Many of the urban areas of Hong Kong are on reclaimed land. The State of California created a state commission, the San Francisco Bay Conservation and Development Commission, in 1965 to protect San Francisco Bay and regulate development near its shores. The commission was created in response to growing concern over the shrinking size of the bay. Hong Kong legislators passed the Protection of the Harbour Ordinance, proposed by the Society for Protection of the Harbour, in 1997 in an effort to safeguard the increasingly threatened Victoria Harbour against encroaching land development. Several large reclamation schemes at Green Island, West Kowloon, and Kowloon Bay were subsequently shelved, and others reduced in size. Reclaimed land is highly susceptible to soil liquefaction during earthquakes, which can amplify the amount of damage that occurs to buildings and infrastructure. Subsidence is another issue, both from soil compaction on filled land, and also when wetlands are enclosed by levees and drained to create Polders. Drained marshes will eventually sink below the surrounding water level, increasing the danger from flooding. Bangladesh – about 110 square kilometres (42 sq mi) in total and has 12,000 square kilometres (4,600 sq mi) potential (8% of total area) up to 12 metres (39 ft) depth in the territorial sea area. about 1/6 (almost 17%) of the entire country, or about 7,000 square kilometres (2,700 sq mi) in total, has been reclaimed from the sea, lakes, marshes and swamps. The province of Flevoland has almost completely been reclaimed from the Zuiderzee. South Korea – As of 2006, 38 percent or 1,550 square kilometres (600 sq mi) of coastal wetlands reclaimed, including 400 square kilometres (150 sq mi) at Saemangeum. Songdo International Business district, the largest private development in history, is a large-scale reclamation project built entirely on tidal mudflats. 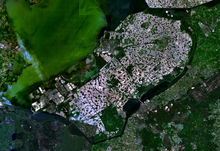 Singapore – 20 percent of the original size or 135 square kilometres (52 sq mi). As of 2003[update], plans for 99 square kilometres (38 sq mi) more are to go ahead, despite the fact that disputes persist with Malaysia over Singapore's extensive land reclamation works. Praya Reclamation Scheme began in the late 1860s and consisted of two stages totaling 20 to 24 hectares (50 to 60 acres). Hong Kong Disneyland, Hong Kong International Airport, and its predecessor, Kai Tak Airport, were all built on reclaimed land. In addition, much reclamation has taken place in prime locations on the waterfront on both sides of Victoria Harbour. This has raised environmental issues of the protection of the harbour which was once the source of prosperity of Hong Kong, traffic congestion in the Central district, as well as the collusion of the Hong Kong Government with the real estate developers in the territory. In addition, as the city expands, new towns in different decades were mostly built on reclaimed land, such as Tuen Mun, Tai Po, Shatin-Ma On Shan, West Kowloon, Kwun Tong and Tseung Kwan O.
Jakarta, Indonesia – Giant Sea Wall Jakarta is part of a massive coastal development project at Jakarta Bay, Indonesia. Manila Bay, Philippines – additional 626 hectares along the eastern coast of Manila Bay created in the 1990s to the 88-hectare Cultural Center of the Philippines Complex. The shore road of Manila (Roxas Boulevard) is actually reclaimed land, as well as its extension road to Cavite (Manila-Cavite Expressway / Aguinaldo Boulevard). Mumbai, India – An archipelago of originally seven separate islands were joined together by land reclamation over a span of five centuries. This was done to develop Mumbai as a harbour city. Monaco – 0.41 square kilometres (0.16 sq mi) out of 2.05 square kilometres (0.79 sq mi), or one fifth of Monaco comes from land taken from the sea, mainly in the neighborhoods of Fontvieille, La Condamine, and Larvotto/Bas Moulins. Tokyo Bay, Japan – 249 square kilometres (96 sq mi) including the entirety of Odaiba artificial island. Kobe, Japan – 23 square kilometres (8.9 sq mi) (1995). Bahrain – 76.3% of original size of 410 square kilometres (160 sq mi) (1931–2007). New Zealand – significant areas of land totalling several hundred hectares have been reclaimed along the harbourfronts of Auckland, Wellington and Dunedin. In Dunedin – which in its early days was nicknamed "Mudedin" – around 2.5 square kilometres (0.97 sq mi), including much of the inner city and suburbs of Dunedin North, South Dunedin and Andersons Bay is reclaimed from the Otago Harbour, and a similar area in the suburbs of St Clair and St Kilda is reclaimed swampland. The international airports serving Auckland and Wellington have had significant reclamation for runway use. United Arab Emirates – Dubai has a total of four reclaimed islands (the Palm Jumeirah, Jebal Ali, The Burj al Arab Island, and The World Islands), with a fifth under construction (the Palm Deira). There are several man made islands in Abu Dhabi, such as Yas Island and Al Lulu Island. ^ "American Society for Mining and Reclamation". Retrieved 2012-04-01. ^ Powter, Chris (2002). "Glossary of Reclamation and Remediation Terms used in Alberta" (PDF). Government of Alberta. ISBN 0-7785-2156-7. Archived from the original (PDF) on 2012-04-09. Retrieved 2012-04-01. ^ Lambi, Cornelius Mbifung (2001). Environmental issues: problems and prospects. Bamenda, Cameroon: Unique Printers. p. 152. ISBN 978-9956-11-005-6. ^ "Wisconsin Supplement Engineering Field Handbook Chapter 16: Streambank and Shoreline Protection" (PDF). United States Department of Agriculture. p. 16–WI–36. ^ "Regional Road Maintenance ESA Program, Part 2: Best Management Practices" (PDF). Washington State Department of Transportation. p. 2.42. Archived from the original (PDF) on 2014-06-11. Retrieved 2014-05-02. ^ Administration, US Department of Commerce, National Oceanic and Atmospheric. "What is dredging?". oceanservice.noaa.gov. Retrieved 2018-03-19. ^ (http://www.hydrant.co.uk), Site designed and built by Hydrant (2013-03-07). "Depth charges: Land reclamation and dredging are big business". Oxford Business Group. Retrieved 2018-02-25. ^ a b Mumbai, Srinath Perur in (2016-03-30). "Story of cities #11: the reclamation of Mumbai – from the sea, and its people?". the Guardian. Retrieved 2018-02-25. ^ "Jakarta clears hurdle in reclamation project". ^ Collin Anderson (2016). DP Architects on Marina Bay: Designing for Reclaimed Lands. Oro Editions. ISBN 9781941806975. ^ Petry, Anne K. (July 2003). "Geography of Japan" (PDF). Japan Digest, Indiana University. Archived from the original (PDF) on 2011-09-28. Retrieved 2009-07-30. ^ Curtis, Daniel R. "Into the frontier: medieval land reclamation and the creation of new societies. Comparing Holland and the Po Valley, 800–1500". Academia.edu. ^ "The History of Ogata-Mura | Ogata-mura". Ogata.or.jp. Archived from the original on 2015-09-24. Retrieved 2014-04-17. ^ "Florida county plans to vaporize landfill trash". USA Today. 2006-09-09. Retrieved 2010-05-07. ^ Borzée, Amaël; Kim, Kyungmin; Heo, Kyongman; Jablonski, Piotr G.; Jang, Yikweon (4 October 2017). "Impact of land reclamation and agricultural water regime on the distribution and conservation status of the endangered Dryophytes suweonensis". PeerJ. 5: e3872. doi:10.7717/peerj.3872. ^ Wallis, Keith (February 12, 1996). "Bill seeks to protect harbour". Hong Kong Standard. Archived from the original on June 4, 2011. Retrieved 2007-03-23. ^ ""Bangladesh fights for survival against climate change," by William Wheeler and Anna-Katarina Gravgaard, The Washington Times". Pulitzercenter.org. Retrieved 3 July 2010. ^ "Singapore Finds it Hard to Expand Without Sand". Planet Ark. Retrieved 2007-03-23. ^ "Courts protect our imperiled waterway – at least for the time being". Hong Kong Standard. August 14, 2006. Archived from the original on October 19, 2012. Retrieved 2007-03-23. ^ DeGolyer, Michael (March 15, 2007). "Commentary: Just Looking for Answers". Hong Kong Standard. Archived from the original on June 4, 2011. Retrieved 2007-03-23. ^ Ng, Michael (October 5, 2006). "Lawmaker warns of West Kowloon arts venue glut". Hong Kong Standard. Archived from the original on June 4, 2011. Retrieved 2007-03-23. ^ "Japan Fact Sheet". Japan Reference. Retrieved 2007-03-23. ^ Chief, Habib Toumi, Bahrain Bureau (2010-01-12). "Bahrain parliament wants solution to land reclamation issue". GulfNews. Retrieved 2018-02-04. ^ Charles Fairbairn (2017-04-04). "Auckland International Airport: A work in progress". Contractor Magazine. ^ "150 years of news: How reclamations shaped Wellington". Stuff. Retrieved 2017-12-13. ^ "UAE Dredging Company Gulf Cobla Delivers Maldives Airport Land Reclamation for Expansion Project - International Dredging Review - May-June 2017". www.dredgemag.com. Retrieved 2017-12-13. Wordie, Jason (18 April 1999). "Land-grabbing titans who changed HK's profit for good". The Standard. Hong Kong. Archived from the original on May 22, 2011. Retrieved 1 October 2010. Wikimedia Commons has media related to Land reclamation.